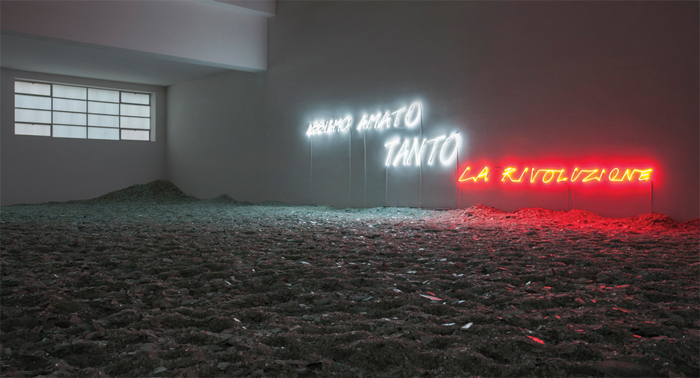 Alfredo Jaar, Abbiamo amato tanto la rivoluzione (We Loved It So Much, the Revolution), 2013, glass, neon, dimensions variable. The squawking sound of a clarinet playing in the background was like a madman’s cry: obsessive, desperate, angry, lacerating. The footsteps of visitors, sinking unsteadily into an expanse of broken glass, created a harsh, broken, crunching noise. 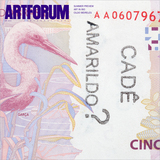 This was the grating sound of “Abbiamo amato tanto la rivoluzione” (We Loved It So Much, the Revolution), an exhibition that Alfredo Jaar dedicated to radical utopia. The title, borrowed from that of a 1986 book by Daniel Cohn-Bendit, appeared on the wall, written in red and white neon, illuminating the fragments of glass (150 tons of it, ground and ready for recycling) that covered the floor of the exhibition space. The phrase reminded us to wonder what has become of the thirst for change, the collective participation in political and cultural action, the utopian charge that characterized the 1960s and ’70s.